If Alphaworld got drunk in 1997, it still has a hangover. Usually when people get a hangover, they can sleep it off in a couple hours, or at maximum a day. Alphaworld GZ must have got really wasted back then because it is still trying to recover from the symptoms. No, the symptoms aren’t headaches or dizziness or even dehydration, the symptoms are simply lack of care and upkeep. The complete absence of these key concepts have lead to certain factors that have slowly piled up over the years to make a not-so-pleasant GZ to both old timers and newcomers. How about we look at some of the specifics of the hangover factors of “AWGZ”, shall we? There are a few factors here and there that are just really irritating to me (and most certainly others) that have been around Alpha for a long time that I just have to throw out into the public eye already. I’m just going to go through a list with full illustration here so everyone can see and understand some of the things that should be fixed within the historic and popular (well, with respect to the rest of the universe) area. This isn’t a big issue; it just leads us to the next one. Sure, sprites were hip and cool with the kids back in the 90’s, but this is the new millennium, man! 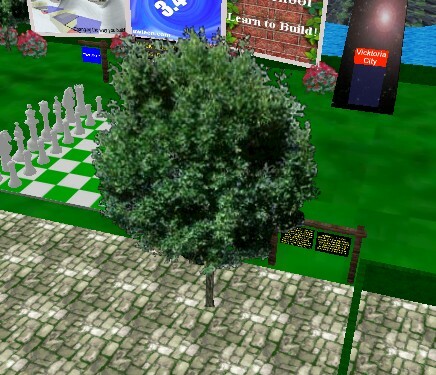 Alphaworld has new objects known to the locals as “tbtrees” that are actually 3d (three dimensional… height, width and length!). They look really nice too when placed around as they tower over stuff and you can even make ‘em sway in the wind with cool features from previous versions of AW (builders hint: create rotate makes them sway). Why not replace these trees with some of the “new” 3D ones? I don’t see the harm what-so-ever; it would only make the area look a lot more “park-y” like it should. The eight signs displayed here are useful to new users to some extent, but don’t you think that some of it is a little obvious? I mean, the ability to keep a contact list and send them messages is usually a given, no? Well, I suppose they could keep that there, but at least get rid of that “Own your own trial world for 30 days free” one, ‘cause we all know that isn’t a benefit anymore. I have a few grudges with ye ol’ AW billboard stack here that I’d like to address. First of all, I personally think AW rocks and I’d really like to tell one of my friends about it. So I naturally “clicked here” on the bottom left sign (as seen above) and I was taken to a website where I diligently filled out the form. I hit send and the page died, I guess it doesn’t work anymore. Should probably update that or get rid of it. Second of all, the sign to the bottom right of the picture above was true back when there wasn’t software like There or Second Life who, in the recent years, totally took over the virtual world scene and knocked AW off the map. Third, why would you stack that big green sign up there on top of the other sign? Like, it just ruins the atmosphere of the park and totally offsets the entire billboard placement scheme of the area. Last I checked, version 3.4 came out about six million years ago. 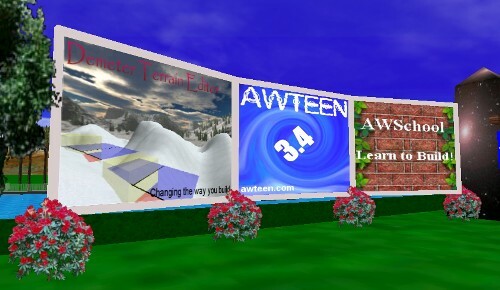 Update this sign with a new ad for something (AWTeen 4.0? AWNews? AWPortals?). The Demeter and AWSchool boards are fine, but even those are getting a little old. 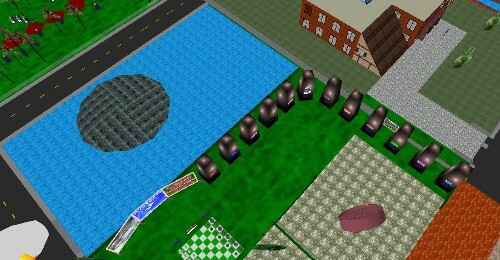 Also, if you look closely those four cute, red shrubs are actually holding up the entire load of the billboards. Cool! It’s a wonder there aren’t more females in AW because of this. 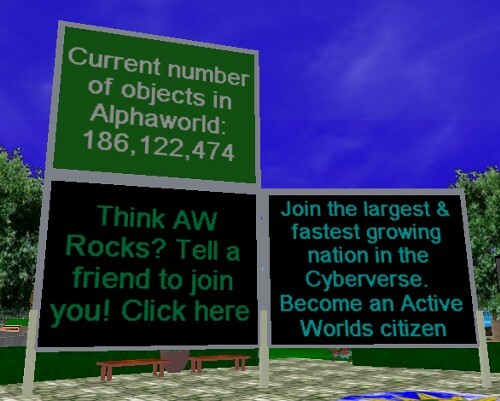 The blue lake behind the teleports and the AWteen billboard is still there because of people who want to preserve the exact history of Alphaworld as it was. Straight up delete that useless area and use this land for something useful like a community portal with links and teleports to active areas within the universe. Speaking of useful teleports, maybe update those old ones (seen in the picture above) with some content a little more relevant. Most of the places linked here were active back in 1998 and are now covered in so much vandalism they aren’t exactly the stuff AWI would like to show off. Link some great towns like Horizon City or R-Town… even though they are dead now they are still way more current and attractive than 80% of the places currently linked. I can’t get a picture of z-buffer, so I encourage you to visit AW 0n 0e and fly around a bit and check out the massive amount of z-buffer (object flickering effect when two objects overlap and their textures don’t match up). Some z-buffer hotspots include the following: -“Filmmakers in the making” amphitheater just to the east. Insane z-buffer here. -Walkways and waterfall structures to the south.